In addition to describing a trust as revocable or irrevocable, there are many types and variations of trusts, depending upon the purpose for the trust. Typical trusts are living revocable trusts to avoid probate and help save estate taxes; irrevocable life insurance trusts; irrevocable trusts to set money aside for college education; special needs trusts; generation skipping “dynasty” trusts; spendthrift trusts; Charitable remainder trusts; and Personal residence trusts; to name a few. Trusts are custom prepared to suit the situation involved. Will the money & property in the trust be subject to federal estate taxes on the death of the Trustors or the death of the beneficiaries? Who will pay the income taxes on the income generated by the trust (ordinary income, portfolio income, or capital gains)? Will the Trustors pay the tax on their personal income tax returns, or will the trust pay the tax on its fiduciary income tax return, or will the beneficiaries pay the tax? Will the property taxes increase if real estate is transferred into the trust or transferred out of the trust? Money and property placed into a properly prepared living trust before your death generally will not be subject to probate court proceedings. Probate court proceedings have mandatory attorney fees which for example on a $500,000 estate would be $11,150 and on a $1,000,000 estate would be $18,000. This is one reason for the popularity of living trusts. A living trust enables you to set and organize the scheme of distribution of your property before death and to see how well the trust and Trustee work. Generally you save a lot of probate fees by doing a trust. A living trust only works to avoid probate if it is properly “funded”. A trust is a separate legal entity just like a corporation or an LLC. The trust shields its assets from Probate Court proceedings because assets owned by the trust. Thus, the trust creators (“trustors”) need to change the ownership of the assets they want to place in the trust so the trust becomes the legal owner instead of themselves. This change in ownership of assets is known as “funding” of the trust. 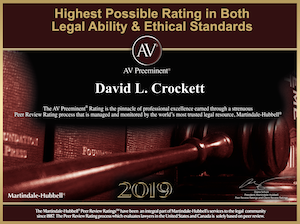 Funding requires proper legal documentation which attorney David Crockett can prepare for you.